Herpes gladiatorum, caused by herpes simplex virus (HSV), is highly contagious and spread by person-to-person contact, with a predilection for the face, arms, and upper trunk. As the name suggests, herpes gladiatorum is common in wrestling, although epidemics are also reported in other sports, such as rugby (Adams, 2002) (Fig. 29-4). Because herpes lacks definitive treatment, it is considered more serious than tinea. Herpes gladiatorum has a prevalence as high as 40% in collegiate wrestlers (Anderson, 1999). Outbreaks generally occur 2 to 5 days after exposure. 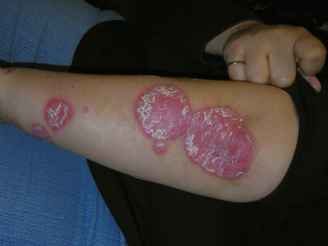 Lesions typically manifest with prodromal pain or itching, followed by clear vesicles on an erythematous base. Primary infections may cause systemic flulike symptoms, and recurrent infections occur in the same dermatome. Often, the vesicles have been traumatized before evaluation, making the rash appear nonspecific, although the prodromal symptoms or history of previous outbreak in the same location suggests herpes. Traditionally, diagnosis was confirmed with Tzanck testing or culture, but the direct fluorescent antibody test is widely available and provides rapid detection of HSV in specimens with greater sensitivity than traditional methods. Figure 29-4 Herpes gladiatorum. Lesions may be numerous in wrestlers and involve a wide area of the skin surface. decrease contagion, and prevent recurrent infection. No one agent has proved superior. The most cost-effective regimen is acyclovir, 400 mg three times daily for 10 days for primary infections and for 5 days for recurrent infections. Treatment is most effective when started at the first sign of infection. Prophylaxis with valacyclovir (500-1000 mg daily) limited herpes gladiatorum recurrence (Anderson, 1999), and acy-clovir (400 mg twice daily) has demonstrated effectiveness comparable to valacyclovir, limiting recurrent genital herpes (Reitano et al., 1998). Research using antivirals for primary prevention is lacking, but entire teams may be placed on prophylactic doses if a team member or opposing team member has an outbreak. Some team physicians offer prophylactic treatment to the squad before large tournaments or for the entire competitive season. Return to play after herpes infection is more conservative than with tinea infection. The NCAA requires that wrestlers be free of any systemic symptoms, have no new blisters for 72 hours, have all lesions crusted over, and have taken treatment doses of antiviral medication for 120 hours before competition (NCAA, 2009).